Peto et al. (2000) suggested that “the incidence of breast cancer in susceptible women increases to a high constant level by a predetermined age” that varies between families. This is important because it means that the age of onset for the disease is genetically determined. To address this hypothesis using population-based data, Czene et al. 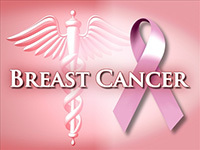 (2009) examined the risk for breast cancer in mothers of daughters with breast cancer. This work provided some evidence in support of Peto’s hypothesis, but effects of calendar year and age make interpretation difficult. To explore this hypothesis, twin data is ideal since the complexity of different time scales is removed. Therefore our objective is to study the extent to which the age at onset is inherited for breast cancer and to address this question using a large twin data set and more advanced statistical methods. This study is based on a large prospective twin study consisting of approximately 150,000 twin pairs in Sweden, Finland, Norway and Denmark of whom approximately 6,000 pairs have at least one diagnosis of breast cancer and 131 monozygotic and 148 dizygotic pairs are concordant for breast cancer. We will first study twin pairs concordant for the disease and estimate the correlation in age at onset. Additional information can be extracted from discordant pairs by conducting a Cox regression of the age at onset including a frailty term. We will also apply or develop statistical methods, for example using Clayton’s cross-ratio or other likelihood approaches. The Heritability of Breast Cancer among women in the Nordic Twin Study of Cancer. Möller S, Mucci LA, Harris JR, Scheike T, Holst K, Halekoh U, Adami HO, Czene K, Christensen K, Holm NV, Pukkala E, Skytthe A, Kaprio J, Hjelmborg JB. Cancer Epidemiol Biomarkers Prev. 2015 Nov 10. pii: cebp.0913.2015.